The post is a quick (for me; when I first wrote it, it was twice as long as it is now) recap of my mental health journey with a focus on how much medication has helped me and how there is no one true method for overcoming mental illness because it’s different for everyone. One of these days I’ll talk about mental health and agency — been on my head a lot recently — and my anger management issues and violence ideation, and the many ways my experience with abuse and my experience with mental illness have fed off each other to shape me and my moral compass, but for now, you’ve got the prologue to all this. It’s hard for me to draw a line and say, “This is when my anxiety began.” I can tell you that I was fifteen when I started having tachycardia and migraines, when I became familiar with electrocardiograms and heart monitors. For a long while the tachycardia was just a thing that doctors couldn’t link to a cause, and when I started hearing the word ‘anxiety,’ it was said dismissively, like you’d say, oh, she’s sad, so she’s crying. It certainly didn’t sound like they meant this is a mental health issue. It sounded like my life — my difficult family and financial situation — was making me nervous, and that nervousness manifested in the form of tachycardia. It took me years to look at myself and think, okay, this is not a physical problem: this is all starting in my head. I don’t know what did it, exactly, but I know at one point I took it upon myself to go see a specialist, and it didn’t help at all. A cold, terse psychiatrist sent me to a psychologist who got me entirely wrong, and I didn’t have the spoons to keep trying. 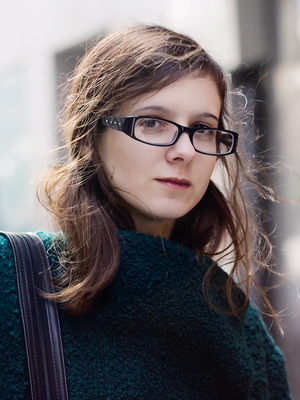 I wanted a therapist, and this was not heading that way, and I couldn’t — can’t — afford to hire one. So I gave up on that route. Fast-forward two years and a friend of mine has decided to try antidepressants. I’ve learned a lot about mental health and anxiety in this time, and I know that friend and I have a lot in common in terms of anxiety, social anxiety and the way we handle it, what triggers us, all that fun stuff. It seems they’re working for her, and I’m still here, living with my parents, stuck rooming with my sister, doing nothing with my life. It’s summer and summer is a slump. I’ve tried yoga on occasion, but I can’t bring myself to stick with it. I figure it can’t hurt, right? But it’s hard to tell in a way that my anxiety is self-evident: evident in my fear of imposing, the way I’ll go over conversations with strangers three million times in my head and feel small and embarrassed, the panic at the mere suggestion of dealing with people in person, the frustration that turns to hyperventilating, the nights tossing and turning because my brain won’t stop being anxious, anxious, anxious, sometimes about a string of things and sometimes about nothing I can pinpoint. So for that, I ask for meds. And I’m prescribed paroxetine. And honestly, my life changes. They’re not magic, obviously, and they’re not for everyone, but as it turns out, they work for me. The things I’ve got away with doing since I started taking antidepressants would send my pre-meds self running for the hills. I started an Etsy shop, I ran an Indiegogo campaign, I took up sewing and textile design, I launched a design business, I started blogging for real. The way I communicate with people has become much more stress-free than it used to be, and more frequent as well. Sometimes I get overwhelmed, and I still have lorazepam to fall back on. There are things that trigger my anxiety, but I can mostly work around them. I surround myself with people who know that mental illness is real, that it can be treated, that you don’t get to tell someone else how to deal with theirs, and that it’s nothing to be ashamed of. I read and I learn and I talk about it, and I let go of hang-ups I didn’t even know I had: just this past year, a harmful comment made me realize that I’d been shouldering a responsibility to not react, to stay quiet and take it when my father insulted me, yelled at me, intimidated me; if I reacted, he’d inevitably get angrier, and he’d take it out on everyone, not just me. But the thing is, that’s on him. I’m not responsible for his behavior, and I have a right to react to abuse. I have a right to choose medication, just like everyone else has a right to choose meditation, or yoga, or whatever works for them. 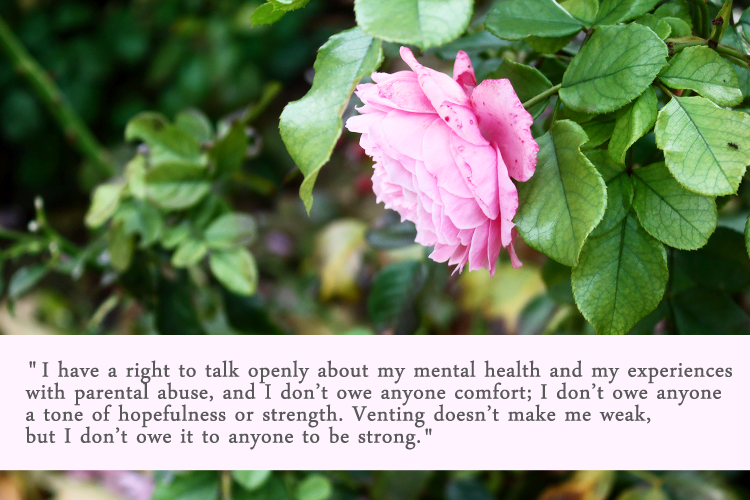 I have a right to talk openly about my mental health and my experiences with parental abuse, and I don’t owe anyone comfort — I don’t owe anyone a tone of hopefulness or strength. Venting doesn’t make me weak, but I don’t owe it to anyone to be strong. This is all my experience, but if you take one thing away from this post, I want it to be this one: mental illness affects the way you’re equipped to deal with said mental illness. Each person is different and mental illness comes at many different levels and hits people in a myriad of different ways that are rarely identical from person to person. Some people are able to kick off the sheets and go through the motions, and some people can’t get out of bed. Some people have external factors exacerbating their illness, and can afford to cut that toxicity out of their life. Some people can’t, and being told to do so will just make them feel more powerless. Some people treat their illness as something external and refuse to let it define them, and some people deal with it by acknowledging it as a part of them. These aren’t right or wrong in themselves; they’re choices each individual gets to make for themselves. Think twice — think a good dozen times — before you judge another person’s choices, or generalize about the best ways to handle mental illness. Chances are they’ve gone through a number of methods and they’ve learned what works best for them.